Does accepting campaign contributions from lawyers at firms with city contracts suggest a culture of pay to play? 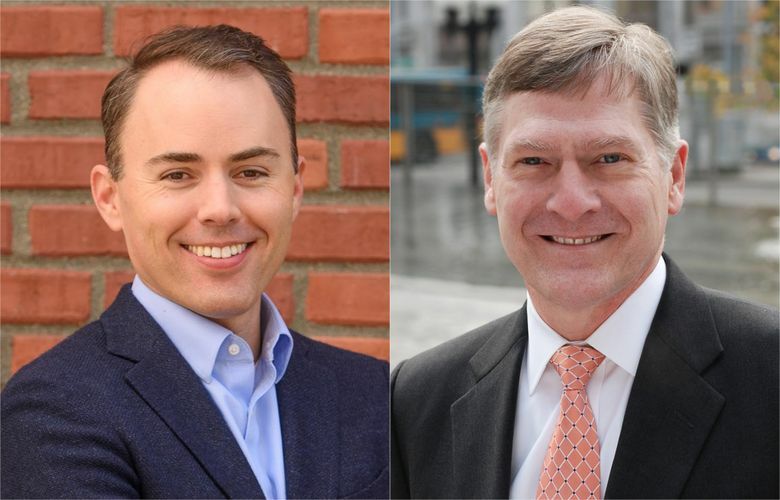 Use of outside counsel is a flashpoint in the Seattle city attorney race. Seattle City Attorney Pete Holmes regularly hires outside lawyers because his in-house lawyers can’t take on every matter. Some of those contracts are awarded without public bids so that legal help can be found quickly and confidentially. With the Nov. 7 election for city attorney drawing near, the millions of dollars Holmes has spent on outside lawyers this year caught the eye of challenger Scott Lindsay. Because some lawyers at firms that have received contracts are supporting Holmes, Lindsay says the two-term incumbent should be investigated for possibly engaging in “pay to play” politics. Holmes forcefully rejects the notion and calls it laughable. About two-thirds of the outside-counsel contracts the City Attorney’s Office has signed this year are with firms where at least one lawyer has donated to Holmes. Lawyers at some of the firms have hosted Holmes fundraisers. Making his case to The Seattle Times, Lindsay said “appropriate authorities should investigate” and he noted that the city’s spending on outside lawyers grew in recent years. In response, Holmes said his campaign has acted properly and transparently. The former bankruptcy lawyer said his office selects firms based on their track records and expertise. Bolstering his argument: Some lawyers at firms with contracts have given to Lindsay, many lawyers at firms with no contracts have contributed to Holmes and several Holmes donors said they’ve given to his campaign simply because they believe in him. “I’ve been a completely open book,” the 61-year-old Holmes said in an interview. Government watchdogs say individuals can legally support a candidate even when their employers have business with the candidate. The watchdogs say their main worry would be particular donations possibly creating an appearance of a conflict of interest. “I would be hard-pressed to say that anything, on its face, is unlawful about someone with business before a candidate contributing,” said Wayne Barnett, executive director of the Seattle Ethics and Elections Commission. Holmes is taking part in the city’s new democracy-vouchers program, so donations to him are limited to $250. Lindsay, 39, isn’t taking part, so he can accept up to $500 per donor. The incumbent has 1,480 donors, while the challenger has fewer than 500. There are differences in the examples Lindsay cites as part of a potential “pay to play” culture. The firm Savitt Bruce & Willey has received 15 contracts since 2010, when Holmes took office, including a contract in January for work led by partner David Bruce. Bruce and partner Jim Savitt and their wives collectively have given $1,000 to Holmes’ campaign, and the firm hosted a Holmes fundraiser Sept. 6. Since then, Bruce has signed two additional contracts for the firm, which the City Attorney’s Office has paid more than $1.5 million in approximately the past two years. Davis Wright Tremaine has signed 14 contracts since 2010, including four this year with partner Jeff Coopersmith, earning more than $2.1 million in the past two years. Coopersmith and other partners have collectively given $800 to Holmes’ campaign, and the firm hosted Holmes’ kickoff fundraiser April 5. Two of the firm’s contracts were signed about two weeks before. “Most of the people who know about the candidates and care about the race are lawyers. That’s just the way it works,” Coopersmith said. Coopersmith’s contracts have been small compared to a 2015 contract with a different Davis Wright Tremaine lawyer who hasn’t donated to Holmes. Of the 56 contracts that Holmes’ office has signed with law firms this year, 35 have been with 13 firms where lawyers have donated to his campaign. The rest have gone to firms where no lawyers have donated to Holmes, including some not in Seattle. Are some firms getting preferred treatment? Are some lawyers more likely to give when Holmes calls? Several Holmes donors at firms with contracts did not return messages seeking comment. Others denied any impropriety, saying they’ve known Holmes for decades. Brian Esler, a partner at Miller Nash Graham & Dunn, where Holmes worked before taking office, donated $50 and hosted a fundraiser for Holmes at his home last month. Records show Holmes’ office signed a $20,000 contract with the firm and Esler in January. Some Holmes donors — such as John Bender, a partner at Ryan Swanson & Cleveland — said they haven’t been involved in their firms’ work for the city. Jeff Tilden, a Gordon Tilden Thomas Cordell partner who donated $250 to Holmes in June and who co-hosted a fundraiser for him in August, said the city attorney has been a friend since the two attended law school at the University of Virginia. Tilden’s firm has received work from Holmes’ office, but he hasn’t been involved in any of those contracts, he said. Two partners who have worked on the contracts, Frank Cordell and Susannah Carr, have also given to Holmes and co-hosted the fundraiser. “It’s a fair question to ask, but the financial consequences to us are virtually irrelevant,” said Tilden, whose firm has earned about $114,000 in the past two years. Another contractor supporting Holmes is Hugh Spitzer, a University of Washington law professor and mostly-retired constitutional-law expert who said his $100 democracy-vouchers donation to Holmes had nothing to do with his contracts advising the city on taxing incomes. Spitzer worked with other city attorneys before Holmes took office, he said. Seattle generally requires public solicitation for significant consultant contracts. But the City Attorney’s Office is exempt when it determines such a process would be legally detrimental. That puts “extraordinary control in the hands” of the city attorney, Lindsay said. If he wins on Nov. 7 and ends up running for re-election, Lindsay won’t accept donations from firms with contracts, he said. Like Holmes, the challenger has accepted contributions from lawyers at firms that have recently received city contracts, including K&L Gates, where he used to work. Only a small percentage of the $130,000 that Holmes’ campaign has raised has come from lawyers at firms with recent contracts. Lindsay, who’s raised about $119,000, says Holmes’ donations are concerning partly because of how much the City Attorney’s Office spends on outside lawyers. In 2010, the office spent nearly $3 million on outside lawyers, many of whom charge much more than in-house lawyers are paid. That dipped to $1.6 million in 2014 but rose to $4.4 million in 2015 and $7.3 million last year. The office has spent about $4 million so far this year, it says. Lindsay has criticized the spending, citing a recent lawsuit by three police officers in which the city lost a $2.8 million jury award. In other cases, the city’s contract lawyers have prevailed. Holmes contends his office’s spending on contract lawyers is largely dictated by forces outside his control. He said he drives a hard bargain on behalf of taxpayers, seeking discounts. Greg Narver, the office’s civil-division chief, said he doesn’t consult with Holmes on run-of-the-mill contracts. Firms get repeat work based on performance, he said. “I don’t pay any attention to who’s contributed,” Narver said. Narver said he would prefer the city budget for more in-house counsel. “I would love never to have to spend on outside lawyers,” he said. Seattle voters approved a law in 2015 banning contributions by major contractors. There are questions about the extent to which the law covers owners and top executives, but candidates generally can still accept donations from employees of contractors. Even when campaign contributions are legal, elected officials should take care to avoid the appearance of a conflict of interest, good-government advocates say. “Our general stance is that individuals retain the right to participate in local races, including by making contributions, even when their employers are involved in business with candidates,” said Elise Orlick, director of WashPIRG. “However, we do think the appearance of a conflict of interest is a legitimate concern,” she added, after hearing of the Holmes fundraisers held by some firms. J. Patrick Dobel, a UW politics professor who once chaired Seattle’s elections commission, said donations close in time to contracts being signed may deserve scrutiny. The aim is to “maintain the perceived legitimacy of the economy of government,” he said. Lawyers at firms with city contracts are among the people Holmes has asked for donations, he said. But Holmes said he hasn’t targeted such lawyers, and he attributed the timing of some contributions to coincidence.